SATs sparked lively conversation as Baltic Slurry Acidification travelled to Brussels to convey the message about reduction of ammonia emissions from agriculture to policymakers and other key stakeholders on the EU level. On November 26th, Baltic Slurry Acidification organised an information seminar on the potential of slurry acidification to reduce ammonia emissions from agriculture. The 360-degree approach of the project was reflected in the program as it covered a variety of different perspectives on slurry acidification techniques (SATs). 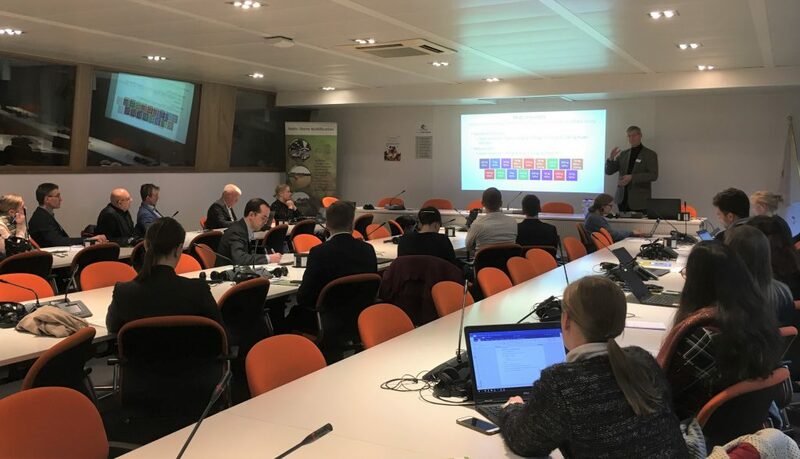 The seminar, held at the Copa-Cogeca Secretariat, was attended by stakeholders in EU organs, national farmers’ unions representatives in Brussels, environmental organisations, researchers, and industry. 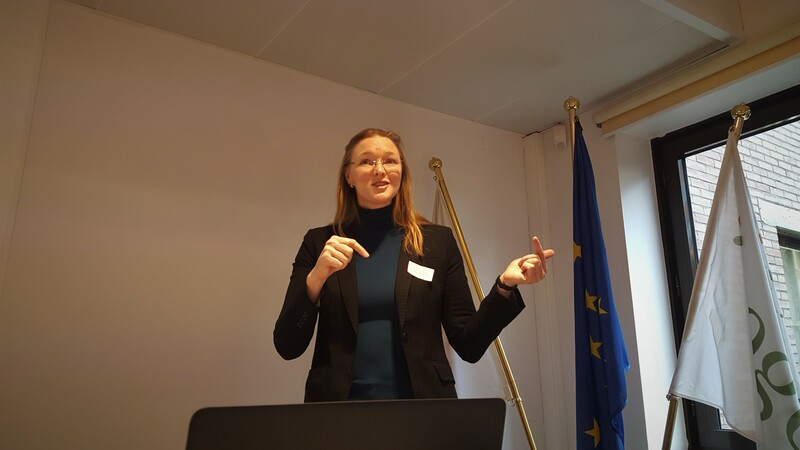 Susanne Lindahl, from the Clean Air unit of DG Environment of the European Commission, spoke about ammonia emissions and EU Clean Air Policy. Ms Lindahl compared the 400 000 annual premature deaths caused by air pollution to the wiping out of the city of Tallinn, each year. She also remarked that the reduction targets for ammonia are in fact quite modest in comparison to other pollutants included in the NEC directive, yet it seems that the countries won’t be reaching the targets set for 2020 and 2030. Ms Lindahl pointed out that large farms are responsible for almost 80% of ammonia emissions from agriculture. Targeting the emissions of these farms would therefore be reasonable from an environmental perspective, and since SAT investments pay off when slurry quantities are quite large it also creates potential for economically viable activity – a clear win-win situation. Commenting on slurry acidification Ms Lindahl stressed the precautionary principle and expressed concern about possible unintended effects of SATs further down the line. She, however, concluded that when used right SATs can be a useful part of the toolkit employed in the abatement of ammonia emissions. The presentations following Ms Lindahl’s demonstrated the long-term research and two-decade long practical experience of using SATs. Baltic Slurry Acidification project leader Erik Sindhöj took the issue from the EU level to the Baltic Sea region and from policy to the actual techniques. Mr Sindhöj presented the principles of slurry acidification, the three different types of techniques and the project activities. 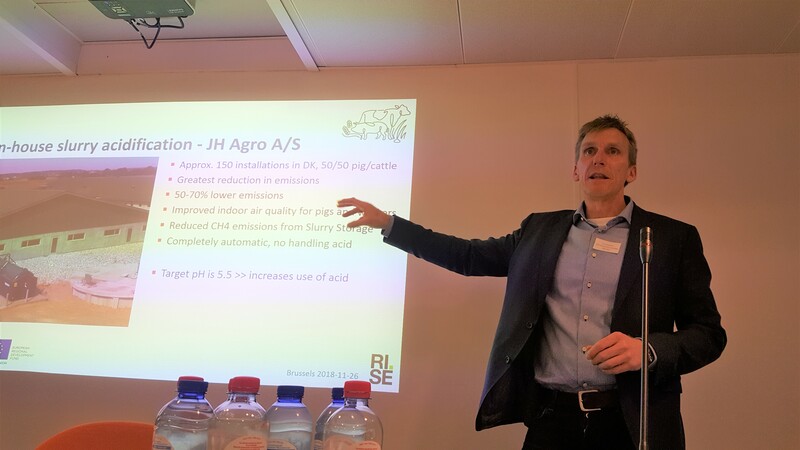 In a retrospective presentation of research related to acidification of slurry professor Sven Gjedde Sommer from Aarhus University presented the significant potential of SATs to reduce ammonia emissions. He also pointed out that slurry acidification also reduces the formation of greenhouse gases significantly. Mathias Tillback, from the agricultural contractor company Br Göransson, gave insights into the experience of implementing slurry acidification. Br Göransson has introduced slurry acidification services into an entirely new market with challenging conditions since the economy of farms tend to be strained. Personal interest in new technologies and concerns for the environment tend to be what drives farmers to try out the slurry acidification services despite the economic challenges. For the abating of ammonia emissions to take off new policies are needed. Henning Lyngsø Foged from Organe Institute, also a project partner, gave an overview of the policies related to SAT implementation in different Baltic Sea region countries and pointed out specific regulations that can support or prevent implementation. Mr Foged also presented potential environmental and economic benefits slurry acidification could have on the environment and the economy of the Baltic Sea region if the whole potential of slurry acidification could be fulfilled. An additional end-user perspective was brought through a video interview Mr Foged had conducted with Esben Graff from the pig farm Håstrupgård. The seminar participants gave their input throughout the afternoon and all presentations were lively discussed. The contributions made for a fruitful and interesting dialog. During the seminar a film produced by Baltic Slurry Acidification and BSAG was launched. The film functions as a popularized introduction to ammonia emissions and SATs. More presentations from previous events can be found here.